"After crossing the Bridge of Invercauld on the north side, there rises to the view of the traveller a most stately and abrupt rock, from the bottom of the glen, clothed with pine for a considerable way up, and rearing a short granite beak that nearly projects across the road. This is Craig Cluny. It is sometimes called the Charter Chest from a tradition that, in times of trouble and danger, the Laird of Invercauld used to hide that piece of furniture within a rock about the middle of the Craig. 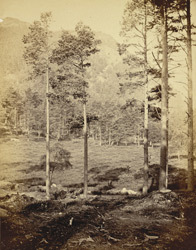 It is also related that, after the battle of Culloden, Colonel Farquharson of Invercauld hid himself in a cave, far up this rock, for the space of ten months, and that, when lying there in the silence of the night, he heard the sounds of merriment which King George's soldiers were making in his own house."